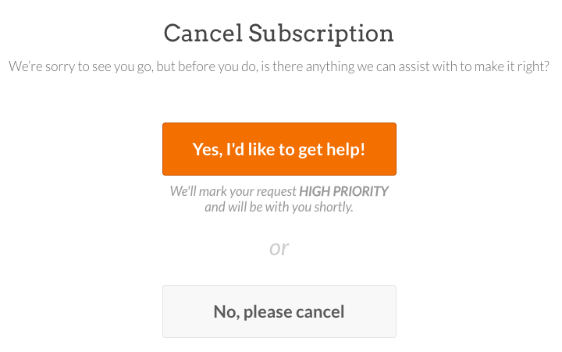 Would you like to either cancel the auto-renew on your subscription, or possibly request a refund? Whether you’d simply prefer to manually renew your account or have found WPForms isn’t quite what your project needs, this guide will show you the steps you need. 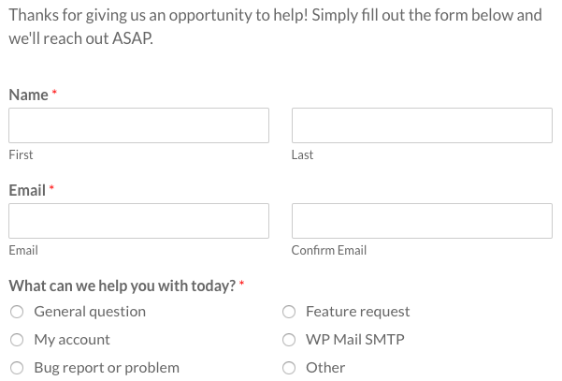 WPForms is a subscription-based product with an annual license. By default, your subscription will be set to auto-renew each year. 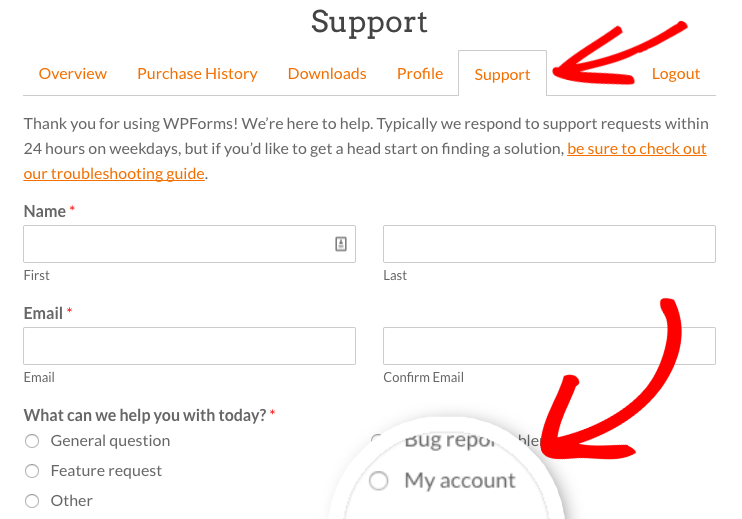 To cancel your subscription, you’ll first need to log into your WPForms Account. Once logged in, you can click on the Purchase History tab. This page will display all of your previous license purchases. To cancel auto-renew on any license, you’ll need to click on its Cancel Subscription link. After clicking this link, you’ll be asked if the WPForms team can assist further. You can choose Yes, I’d like to get help! if you’d like to contact support for assistance, or you can choose No, please cancel to proceed with the cancellation. Go ahead and select the option that makes the most sense for you. If you decide that you’d like to get help from support, a form will open where you can share all of the details on how our team can best assist. 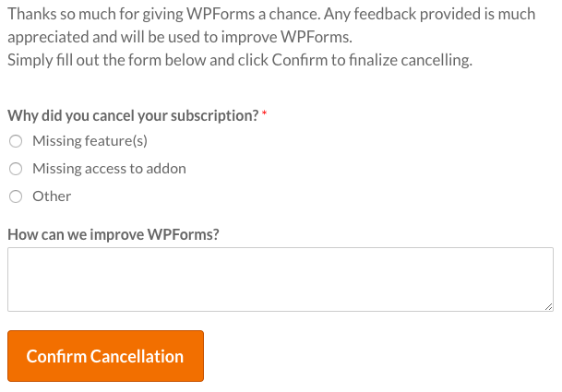 Or if you decide to proceed with the cancellation, you’ll be asked a couple of short questions to help improve WPForms. This form must be completed in order to complete the cancellation. WPForms is proud to offer a 100% No-Risk Double-Guarantee. This means that if you give WPForms a try and decide within the first 14 days that it isn’t a good fit, we’ll provide a full refund. If you’d like to receive a refund within this 14 day window, please go to the WPForms Support page. From here, you can set the topic to My Account. Then in the Message box, describe the nature of your request and submit the form. Note: Of course, we don’t want to see you go. If our support team can help in any way, or if there are specific features you’d like to see, please feel welcome to let us know in your message. Our team will respond as soon as possible to keep you updated on the status of your refund. That’s it! This is all you need to do to cancel the auto-renew on your subscription and request a refund. If you have any other questions about your subscription, please get in touch with our support team and we’ll be happy to help!